DRIVERS caught veering into bus lanes to cheat their way out of traffic jams can expect to be hit with stiff fines from this weekend. New enforcement cameras were brought in to target bus lanes at the end of March. Until now, however, a 'grace period' has meant motorist captured on camera breaking the rules have escaped without a fine. But that is now set to change, after the city's transport chief moved to tweak the local authority's powers. From Monday, motorists caught on camera beating heavy traffic by using bus lanes can expect a £60 fine to land on their doorsteps. The move, though initiated by the city's former Tory administration, is among a raft of transport measures being drawn up by the new ruling Labour group on the council. The Herald revealed last month how Plymouth could get a whole fleet of controversial camera cars, some patrolling outside school gates. FIRST NEW TIMETABLES ON WEBSITE TO START 02/09/12. UGOBUS BACK TO OLD FREQUENCY. UGO15 EVERY 20 MINS MON - FRI AND Sat UNTIL 3pM THEN 30 MINS SAT AFTERNOON. AT LEAST THE CUT BACKS WERE TEMPORARY!! There's no need to SHOUT. I'm not hard of hearing! Speaking to a First driver this afternoon and he reckons that it is a very strong rumour going around at First that Stagecoach will buy First's Plymouth area operations later this year..especially now North Devon has fallen through. I can't see First selling Plymouth and it would have nothing to do with the sale of North Devon falling through if they did. I wouldn't believe all the rumours from drivers. The older buses are only here for the olympics, there will be a return of the 12 plate deckers after, plus more buses from barnstaple. Hopefully First will stay but up their game and become effective opposition to Citybus. EVENING SERVICES PLEASE!!! Yeah I agree, and i think Graham should monitor people commenting, as a first driver i am also sick of people slagging First off saying we're gonna loose our job's, does anyone know how hard the job market is at the moment??????? 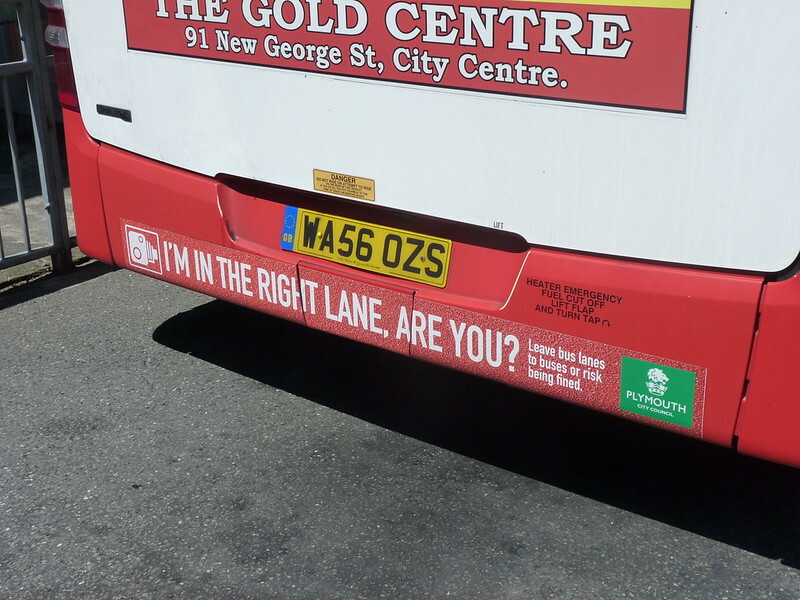 "motorists caught on camera beating heavy traffic by using bus lanes can expect a £60 fine to land on their doorsteps." An interesting statement, and fair enough; but why are fines being sent out for crossing empty lanes! ?